"I thought I would die there," said a Louisiana inmate. "I waited 41 days for my HIV medications... They did nothing for me at all." This chilling story comes from a new report that details how the U.S. criminal justice system is violating human rights, failing to provide basic HIV services to thousands of inmates in jails in Louisiana. 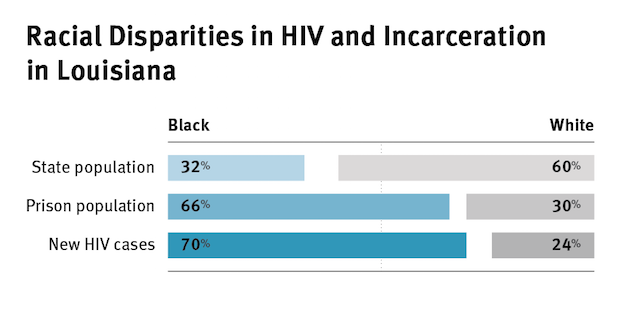 "Paying the Price: Failure to Deliver HIV Services in Louisiana Parish Jails," an exhaustive new study by Human Rights Watch, or HRW, shows how mass incarceration intersects with the HIV/AIDS crisis. 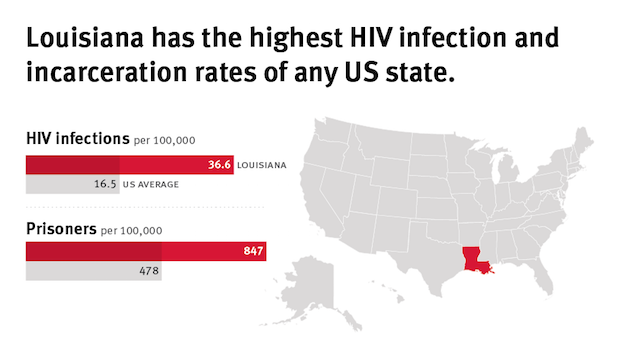 “Louisiana is ‘ground zero’ for two epidemics in the United States, with the highest rate of new HIV infections and an incarceration rate above the national average,” explained the author of the report, Megan McLemore, a senior health researcher at HRW. The report documents "inadequate, haphazard, and in many cases, non-existent HIV testing, treatment, and linkage to care" in the state's criminal justice system. Louisiana has 104 parish jails, and only a handful offer HIV tests to every inmate on entry — a policy recommended by the U.S. Center for Disease Control. The state Department of Corrections "operates a two-tiered system that neglects HIV services for the nearly 18,000 state prisoners housed in parish jails," HRW says. "In many jails, HIV treatment is delayed, interrupted, or denied altogether, and continuity of care is disrupted by failure to link HIV-positive prisoners to medical care in the community when they leave the jail," the rights group reveals. This endangers the health not only of affected individuals, but also of their communities. The death rate from AIDS in Louisiana is one of the highest in the U.S. In order to get a more exhaustive look at the problem, HRW interviewed more than 100 people, including those recently released from parish jails, along with medical staff and officials in the health and justice departments. Many inmates said they were locked up for weeks and months without receiving HIV medication. If they did receive it, it was only sporadically. HRW also made a short documentary that details the report's findings and includes some of the interviews. One of the primary reasons jail officials interviewed by HRW said they did not test for or treat HIV is simply because the treatment is expensive, and they did not have the money. “Louisiana spends billions on its prisons but has failed to find the money to test for and treat HIV in local jails,” McLemore explained. “This is not acceptable for public health or human rights and creates costlier medical problems down the road,” the HRW senior health researcher insisted. A nursing director at a Louisiana correctional center told the rights group for the report, "Why don’t we do routine HIV testing? We cannot afford to treat someone who was identified as HIV-positive. It sounds cold, I know, but that is the reality." Even more disturbing, however, are the ways in which all of this feeds into the cycle of mass incarceration. The U.S. has the highest incarceration rate in the world. With just 5 percent of the global population, the U.S. has almost one-fourth of the world's prisoners. "Nowhere is the need for reform more urgent than in Louisiana, which incarcerates people at a higher rate than any other U.S. state," HRW says. Louisiana incarcerates residents 150 percent more than the national average. "In Louisiana parish jails, thousands of people charged with minor, non-violent crimes endure lengthy pre-trial detention, and those with HIV often go undiagnosed, untreated and without effective community care upon release," HRW says. And "the same socioeconomic factors that place people at risk for HIV—poverty, homelessness, drug dependence, mental illness—also place them at higher risk of incarceration," the rights group adds. Incarcerated Americans are more than three times as likely to contract HIV as the average population, and one out of seven people living with HIV will be imprisoned each year. Louisiana AIDS service providers told HRW that between one-quarter to one-half of their clients have been in jail or prison. Approximately one in 75 Louisiana adults is in jail or prison. And around one in seven people in the state with HIV do not even know they have it. "The HIV epidemic and the criminal justice system are marked by similarly disturbing racial disparities" as well, the report reveals. Louisiana's population is just 32 percent black and 60 percent white, but 66 percent of its prison population is black and only 30 percent is white. Moreover, 70 percent of new HIV cases happen among black Louisianans, while just 24 percent take place among whites. The U.S. average for HIV infections is 16.5 cases per every 100,000 people. In Louisiana, however, that figure is more than twice as high, at 36.6 cases. Mass incarceration rates are also almost twice as high. On average throughout the U.S., there are 478 prisoners for every 100,000 people — an already out-of-control statistic with few comparisons anywhere else in the world. In Louisiana, however, this figure is even higher, with 847 people imprisoned for every 100,000 residents. The report was released on March 29, on the Louisiana AIDS Advocacy Network’s Legislative Awareness Day, in which hundreds of people from around the state visited the Capitol to describe the hardship of living with HIV. In it, HRW calls on the state government and Louisiana Department of Corrections to implement policies that respect the human rights of their incarcerated residents. “The government is obligated to provide medical care to people living with HIV in parish jails,” McLemore says. "There is no time to waste," HRW stresses. "Detention in Louisiana parish jails endangers the health, safety, and the very lives of people living with HIV."